Although there are probably no technical drawings of the Piggins Brothers' four-stroke engines still in existence, photographs as well as the schematic diagrams in US patent 898 678 tell us a certain amount about how these engines functioned. The cylinders were individual modules, a pattern that predominated in small marine engines of the period and is still seen today in large ship's engines. The intake and exhaust valves were at the sides of the cylinder in a configuration that later became known as the T-head type. The Piggins automobile engines had their fuel-mixture (and water) pipes built inside the motor block in the form of hollow channels in the castings. The picture at right of the six-cylinder engine from its manifold side clearly shows the external pushrods, inside spiral springs, operating the exhaust valves. The 12 intake and exhaust pushrods would have been driven by two camshafts in the block and would no doubt have clattered during operation, making this a fairly noisy motor as well as creating inertia that limited its maximum number of revolutions. The shiny buttons on the valves may have been decorative only: they are not present on the 1915 marine 4-cylinder motor. The hoses and ignition wiring were removed when this photograph was taken, but most of the other structures are in place including breather pipes, which were used to add lubricating oil. Early engines lost oil and motorists had to stop and top up oil every 100 to 300 miles while driving. The breather pipes are evidence that this engine had a splash rather than a pressure-pump lubrication system. The coolant circuit is readily visible, with water drawn by the pump from a radiator at left (not shown) into the engine base, then circulating up internal passages to the bulky water jackets cast around the cylinder tops (the hottest spot), before flowing out taps into the water manifold (the horizontal pipe at the top) and returning to the radiator, where waste heat was removed with the help of the cooler fan. The drive train was attached at the fly wheel on the right of the picture above. All the engines were decorated with company plaques on every pair of cylinders. These name plates read: "Piggin Bros Racine Wis USA Pat Apld For". The Piggins trucks brochure says a two-cylinder version of this Otto cycle engine was also available. The picture at right of the other side of the motor provides some idea of how the fuel mixture was fed to the cylinders and fired. Daniel Dorece, a collector and expert on early engines, suggests the carburetor shown came from Schebler of Indianapolis IN and the magneto was supplied by the K-W Ignition Corp of Cleveland OH. The pushrods for the intake valves are more clearly visible here than in the preceding picture. The petcock at right, a small tap, was a common feature on such engines to check the level and quality of oil in the sump. Above it are the various drives to the camshafts, magneto, pumps and fan. The fuel-air mixture was channelled internally up this side of the cylinders to the intake valves. A careful look at the photograph will disclose this passage as an edged relief on each cylinder. These conduits are advertised as a special feature of the engines in the trucks brochure, and the principles are explained in the Piggins patent. 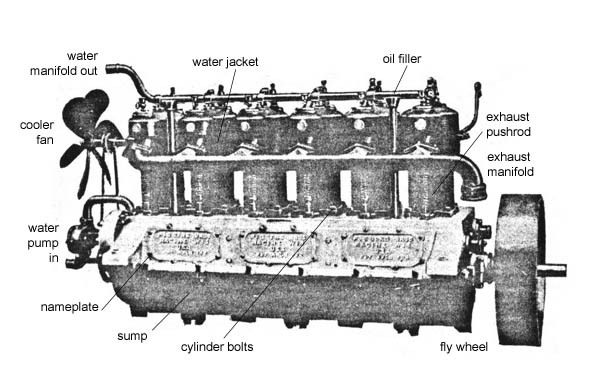 Advantages resulting from the casing construction of this [engine] are that the passages for the explosive mixture being within the cylinder walls are thereby kept heated during the operation of the engine and give to the gas passing there through a preliminary heating which results in a more efficient operation than would otherwise be the case. Also, because of the water passages being located within the cylinder walls and the water conduit being located within the crankcase, there is less liability of the water freezing than when it is conducted to the water jackets through exposed tubes. 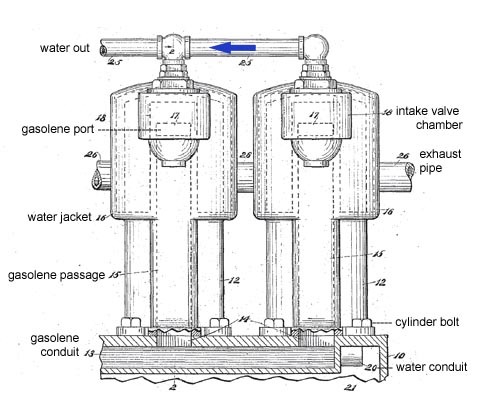 The schematic picture at right (from the patent) shows why the engine design was called T-head or T-block: the structure's cross-section is shaped like a capital letter T, with the ports at the side, not the top, of the cylinder. The inlet and exhaust chamber valves are operated by pushrods (valves and rods not shown) coming from below. The T-head and related L-head designs were sometimes also termed "flat-head" engines, but the Piggins Brothers motor is not strictly flat on top: it had its coolant outlet there. The spark plug (also not shown) was set in the head, close to the intake port at right. The air-gasolene mixture from the carburetor is ducted up the hot channel at the right to the intake chamber, while fresh coolant arrives through the other marked channel. As will be fully appreciated by those familiar with the art to which this invention belongs, the very act of fitting the cylinders in place on their crankcase completes the [gasolene] and water supply connections, it being only necessary to connect the carburetor with [an inlet] to supply all cylinders with their charge and to connect [the water inlet] with the water supply to provide the water jackets of all cylinders with cooling water. The diagram at right distinctly shows the ducts leading up the side of the cylinders which were only visible as shadows in the second photograph at the top of this page. The schematic picture also illustrates how each cylinder was a completely separate structure, bolted onto the base or carrier. To detach a single cylinder, only the water manifold, exhaust manifold and fixing bolts had to be removed. The cylinder could then be simply lifted away from its piston and connecting rod. It would seem that separating the cylinders into single structures rather than fashioning them as bores in a metal block was too obvious to be patentable. Various marine engines by other manufacturers of the period shown on the Old Marine Engine discussion board were also built this way. Detroit, however, preferred cylinders fused together. Indeed, under Ford's lead, by the 1920s, the cylinder block (formerly cast iron) and the crankcase (till then aluminium) had been fused into the monobloc to further reduce automotive engine-manufacturing costs (Nunney, p.9). Don Piggins, a descendant and modern auto engineer, points out that the one-piece monobloc spawned its own repair technology and expertise following its commercial success. By contrast, the big drawback of a Piggins-style divided block would have been wear. Each piston, bore and crankshaft risked being assembled in a slightly different position, so the machining tolerances of these parts would have had to be very fine. "It is quite possible that machining for fitting up was accurate enough for function and modest performance on these early motors. Then too, it is possible that materials used for crankshafts, pistons and block bores allowed each motor, if properly broken in, to 'wear in', so to speak. If that is the case, I wonder how replacement of a cylinder affected the performance of a worn-in motor," he observed. 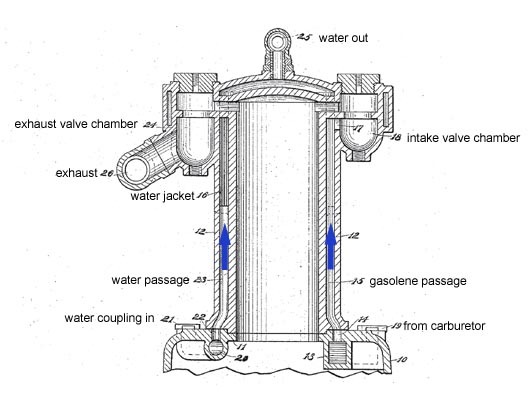 By means of this invention, the cylinders may be made separately removable for purposes of repair, the embedding of the gas and water conduits in the casing permitting this to be done with ease, it being then only necessary after the connection rod of the desired cylinder has been disconnected to disconnect the water discharge pipe and to detach the connecting flanges of the exhaust pipe from the exhaust valve chamber of the particular cylinder which it is desired to remove and the cylinder may be disconnected from the crank case and lifted from place without disturbing the other cylinders. Considerable difficulty is usually experienced in making the necessary tight fitting of pipe connections for multiple cylinder engines when tubing is relied upon for supplying the cooling water to the jackets and explosive mixture to the cylinders as well as for discharging the exhaust gases and for removing the water from the jackets, the tubing then constitutes a network which interferes with the accessibility of the other parts of the engine. With such constructions, the removal of one cylinder for repairs has usually necessitated the dismemberment of the entire engine. It is an object of the present invention to avoid pipe fitting to a material extent and to dispense with the obstructions to the accessibility of the working parts by conducting the cooling water and the gas(olene) through passages in the crankcase and the cylinder walls. The summary of US Patent 898 678 makes clear that Piggins was granted patent protection for achieving a combination of objectives in a new way. The summary of what was newly invented can be paraphrased as follows: (1) the principle of any engine casing with conduits in its base registering with coolant and mixture passages in the cylinder, whether in single-cylinder or multi-cylinder form, and (2) the solutions needed to apply this principle to the multi-cylinder engine. A broadly similar US patent, number 904 562, was granted only two months later in 1908 to Edward Rathbun of Rathbun-Lacy Co, Toledo OH, but it is difficult to see the merit of that patent, other than the fact that Rathbun's "Ralaco" engine was a two-stroke marine design that ducted exhaust too through the block. Separate-cylinder engines have still not completely gone away. The Buck Diesel small marine engine set to be launched in 2008, exactly 100 years after the Piggins automotive engine, once again exploits this exotic idea for the same key reason as then: the ease of repair. 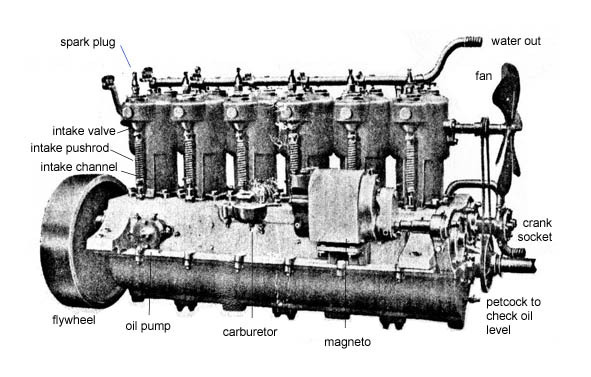 The Piggins engine was the oldest prior-art, modular-cylinder design to be recorded in Mike Buck's US patent: Buck's team exhaustively researched US records when filing for that company's 2005 patent, number 728 7493, for individually cooled cylinder assemblies. We wish the Buck project well. With long running at constant revolutions and a more even load driving a marine propellor rather than road wheels, the Buck diesel may prove a great product for the marine power market, and can be built using far superior casting and machining technology to that in Racine workshops a century ago.